1. Preheat the oven to 220°C, gas mark 7. Place the chicken thighs in a large roasting tin and squeeze over the juice of ½ lemon. Season, scatter with the oregano, drizzle with 1 tbsp olive oil and roast for 30 minutes. 2. Remove the chicken from the oven and scatter the broccoli into the tin, stirring to coat it in the cooking juices. Return to the oven for a further 10 minutes, until the chicken is cooked through and the broccoli is charred and just tender. 3. 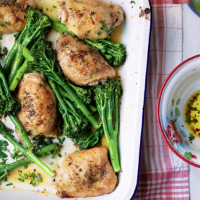 Meanwhile, combine the parsley, juice of the remaining ½ lemon, chilli and remaining olive oil; drizzle over the chicken and broccoli and serve.